LAI Mohammed, the minister of Information and Culture, has said the time has come to retire the political oligarchs who have appropriated Kwara State and its resources to themselves to the detriment of the people. 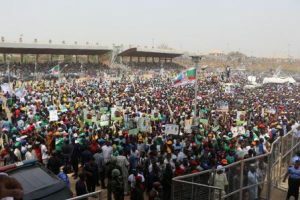 The minister made the remarks while addressing the mammoth crowd that attended the All Progressives Congress, APC, presidential rally in Ilorin, Kwara State on Monday, February 11. Mohammed warned that voting the present crop of leaders in Kwara State into power again is like giving them another licence to embark of a looting spree, and urged the people to be wary of their Greek gift under the guise of offsetting workers’ salaries. He also listed the roads being rehabilitated or constructed to include the Ilorin-Kabba Obajana road; the Ajase-Ipo-Offa-Erin Ile-Osun state boundary; Kaiama-KIshi Road; Offa Bypass in Offa as well as the dualization of Michael Imoudu Ganmo/Afon junction road Ilorin. In addition, Mohammed said about 50,000 Kwarans are benefitting from Tradermoni and Marketmoni, 9,886 homes in Kwara State are benefitting from the Conditional Cash Transfer that gives 5,000 Naira monthly to the most vulnerable while the Anchor Borrowers’ Programme has seen the number of rice farmers in Kwara grow from 5,000 to 30,000. He, therefore, urged the people of the state to vote for Buhari, Abdulrahman Abdulrazaq, the APC governorship candidate and all other APC candidates in the forthcoming elections. 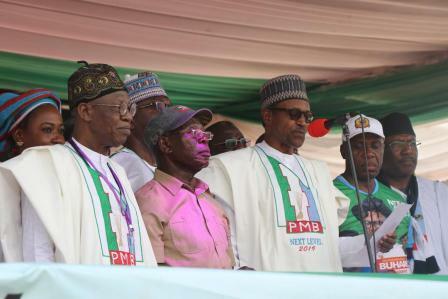 The mega rally was attended by Buhari; Adams Oshiomhole, the national chairman of the APC; Bola Tinubu, a national leader of the APC; Bisi Akande and Rauf Aregbesola, former Osun State governors as well as Rotimi Amaechi and Abdulrahman Dambazau, ministers of Transportation and Interior respectively, as well as Abdulrazaq Abdulrahman, the APC governorship candidate in Kwara State, among others.